OGKL has stepped its foot into another adventure and this time around it was in Cameron Highland. 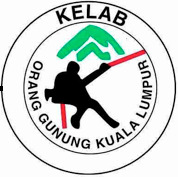 The trip on the 15th – 17th August was OGKL’s second visit to Gunung Tangga after the year of 2007. Nevertheless, the adrenaline of 23 participants including 6 committee members rushed through the veins as this trip was the first, for some of us. The venue before the journey started was set at LRT Gombak. The eager participants have started to swirl around LRT Gombak since 10pm and some, even earlier than that. The expedition began with 7 cars all together. All drivers have stiffened up their eye lids to stay awake and drove safely, while most of the other members slept soundlessly. 2 o’clock in the morning sharp! We have reached our first pit stop, which was RTC Simpang Pulai to boost up and some of us were kind of starving. So, we headed up to the café and filled up our cranky bellies. Without any delay, we heated up the engine and left to our next pit stop, Masjid Keputeraan Lojing. Alhamdulillah, the road journey was perfectly fine and we arrived at Masjid Keputeraan Lojing safely. Thanks to all the drivers! You guys were the best! After a while, we hooked up with another 2 cars at the mosque, as they drove directly from Penang and Kuantan. All of us were freezing with the fresh breeze and hurried ourselves into the mosque to warm ourselves up and take a nap. The adzan was called out not long after our deep naps. That particular morning, the scenery was splendid! One by one started to wake up, perform prayer, had breakfast and get ready to forward ourselves to the adventure of Gunung Tangga. We left to the Lojing Police Station to inform the police regarding the duration and some of participants of our expedition to Gunung Tangga. All the assigned drivers parked their cars at Pak Kassim’s house (The Guider) and walked to the starting point, where all the other participants have been dropped off earlier. Everyone started to gather around and began the warm up session which was led by one of OGKL members, Ferhad. Right after that, all the participants were given brief reminders by the leader of the expedition, Jan Rock and prayers were recited by Syamil to ease the journey. The adventure began! For an hour or so, we had to walk on 45 degrees timber trail and back into the woods. Every step was full of excitement and things just got better when we had to cross over 3 rivers. Sense of balance was on trial! No doubt about it! From balancing your steps on river stones, wobbly bridge, to walk on a huge long log. The log fell perfectly as a link from one side to another, as if it knew people would use it as a bridge. We have reached the 2nd last water point, put aside all of our bags and dashed to the area where the flourished Rafflesias were found. There were only 2 Rafflesias and according to the guider, Rafflesia should not be touched and its lifespan is only around 2 weeks before it decays. Hence, we were lucky enough to enjoy the beauty of Rafflesia. But, we were not the only lucky ones, there were some students who came to do some research on it and there were also quite a number of European tourists who shared the same excitement as we did. After several photo sessions with the Rafflesias, we headed back to the water point to have our lunch and some of us managed to have a short bath at the water point. The water was quiet cold and totally energizing! 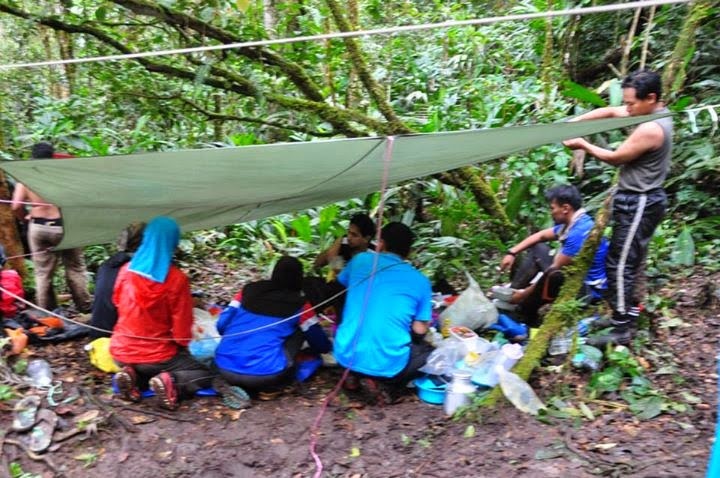 Everyone was contented after enjoying the beauty of Rafflesia and ready to pull up their anchors and get moving to the first camp site. The track was kind of ramp for only about 20 minutes before it got steep right until the first camp site. This very first camp site was named after Pak Kassim and it was the last water point at Gunung Tangga. The water was not as lavish as the previous one, but it was enough to make use as drinking water and cooking purposes. Later that night, after the shelter were set, OGKL committees started preparing the dinner with the help of some participants and some other make used of the serenity to get some rest and get to know one another. Rise and shine! There was a wakeup call from our sous chef (Razman). He was up earlier than any one of us, as he has started to prepare the breakfast. It took around two and a half hour for everyone to perform Fajr prayer, breakfast and get ready to hike up to the peak. We have reached ‘Kem Spenda’ or ‘Boxer Camp’ as told by Pak Kassim. We took a break for few minutes and continued our way, up to the peak of Gunung Tangga. We have made it! We started to change our sport attires to ‘Baju Raya’ and take out all Raya Foods that were brought up by some of us. While waiting for the other participants and committees, we have captured tons of photos and it just got exciting when everyone else arrived. The last person reached the top was around 11.00am. The peak area was not that spacious, however, it managed to occupy 29 of us with all sorts of characters and it was the best feeling you could ever asked for at that particular moment. We started to descend to our camp site. It went smoothly, even though, there were few minor injuries encountered. Right after we have reached the camp site, we started to pack our bags. Clear the camp site area, especially from plastics. Making sure we leave nothing, but foot prints. We also had our lunch before descended to the starting point. So, we went through again all the routes that we stumbled upon when we were ascending. Finally! We were back at where we started our expedition.